Hello there! After a long period of extreme work and a decent period of vacations, I'm back to reading and blogging (hopefully). The latest series I've been loving is the Goddess Unbound series by T. D. Thomas. I've received the first book in 2012, actually, and seem to have misplaced the file until I found it during my vacations and read it in one day. It was amazing and I was dying to share with you but, more than anything, I needed the sequel, so I got that one and the review is coming up soon too. 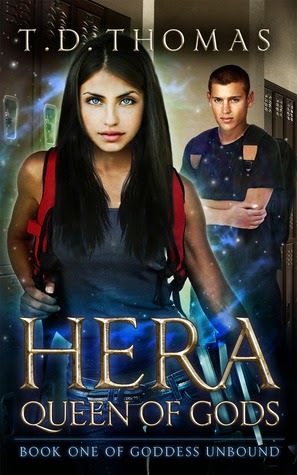 When the Fates go missing, most likely kidnapped, Hera, Queen of the Gods, has to descend into the mortal world to try and find them in a city that is being kept in the dark from the Gods, with a dark cloud stopping them form seeing. She and 6 other gods take mortal bodies - teen bodies, for teenagers understand it better than anyone that it's all about power - and start looking for the Fates. Zeus, Hera, Athena, Demeter, Artemis, Apollo and Hermes take mortal bodies and roam the world, looking for any sign or information about the Fates, who took them or what they are planning on... When they stumble into Justin, a mere mortal teen boy. Strangely, Justin seems to be able to tell there's something wrong with those people who used to be random students at his school and are now banded together using weird "nicknames". When their cover story doesn't work well (not as easy to hide the truth when you are using your powers and a giant is after you), they are forced to tell him the truth. He's taken along and proves himself quite useful, but I won't spoil anything. One of the interesting points was that the Gods were only allowed to take one power each, because the mortal bodies couldn't hold all of their powers. Hera took the power of mind control, through her eyes, Zeus took strength, Athena mind reading, Demeter plant control, Artemis shapeshifting, Apollo healing and Hermes invisibility. But since they are used to having so many powers, it's hard for them to survive with only one and when they find out that these mortal bodies are more frail than they thought, well, things start getting scary. Monsters keep going after them, specifically, Pythons and Harpies. All the time. Everywhere they go. So not only they have to fight the monsters and, usually, run, because they aren't as powerful as they would be and there are many monsters, they still have to find the Fates, whoever kidnapped them AND stop whatever plan they may have that, the Fates being as powerful as they are, most likely is something like destroying the fabric of reality. It is supposed to be a YA story, since the main characters are either teenagers or in teenagers' bodies, but I can barely picture them as 17-18 year olds, it seems like they are so mature, even the non-god(esse)s ones, that it's hard to picture them as young teens. Besides, the themes on the book and the way they're portrayed is quite grown up, which makes it hard to believe it's YA. So I wouldn't recommend for young or impressionable people, but older teens, that would be awesome. So, now, click click, go buy! And keep tuned for the sequel's review!